For someone who always bangs on about how much they dislike horses in fiction, as I am so suspicious of them in real life, you might think I am not a lover of nature. Actually I am a bit of a nature geek, I will lose the tiniest bit of street cred I have left now by saying I used to be a bird watcher or ‘twitcher’ (we won’t mention the stamp collecting, oops) and any television show with David Attenborough I have to record and will then watch enraptured. 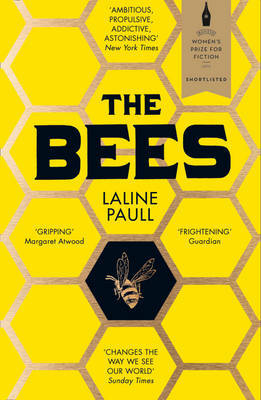 It is my fascination with nature that led to a small obsession over the New Year that I simply had to read Laline Paull’s debut The Bees a tale about a hive of bees. Even the fact that these bees talk (and we all know that I am deeply distrustful of talking animals in general) didn’t put me off. I did wonder if it might be a little Disney like yet as I discovered it couldn’t be further on the opposite end of the spectrum, The Bees is a gripping and often chilling literary thriller – make no mistake. She dragged her body through and fell out onto the floor of an alien world. Static roared through her brain, thunderous vibration shook the ground and a thousand scents dazed her. All she could do was breathe until gradually the vibration and static subsided and the scent evaporated into air. Her rigid body unlocked and she calmed as knowledge filled her mind. This was the Arrivals Hall and she was a worker. Her kin was Flora and her number was 717. And so Flora is born into the world of the hive and the hive mind. As a lowly worker Flora instinctively knows from birth she only lives to do four things; accept, obey, serve and be prepared to sacrifice everything for her beloved holy mother, the Queen. But Flora is not like the other bees, something which one of the Sister Sage’s (the priestesses of the hive) notices from her birth, she is different. While mutant bees are usually destroyed by their own kind, Flora has talents others of her kin don’t (speech and the ability to act alone, worker bees naturally just collect and dispose of the dead until they are, well, dead) and so is removed from sanitation duty and is allowed to feed the Queen’s offspring, before becoming a forager out collecting pollen. However Flora is also different from all the bees in another way (which I won’t spoil for you) and soon Flora becomes both a threat to the hive and potentially its only hope of survival. Laline Paull does so many brilliant things with this book it is frankly rather difficult to know where to begin. Firstly though let us start with Flora 717 who, after getting over the initial unusual narration from a talking bee, is a wonderful protagonist and the perfect antiheroine in a novel that i by its very nature one of totalitarian regime. She questions things, she questions everything, she answers back, she does things she shouldn’t and she’s blooming brave in the face of many dangers. She’s gutsy and we all like a feisty protagonist don’t we? She is also an outsider and so we have empathy for her, especially when things take a darker and more complex turn. Paull also creates a dark, controlled and claustrophobic world where orders must just be obeyed and the constant threat of ‘The Kindness’ lies in the eyes of all the other bees working to one hive mind. These are not cute and cuddly bumble bee’s, these are honey bees which, pun intended, are not as sweet as they sound – for example there is a massacre, which happens once a year, that I found genuinely shocking. There is also the danger of the outside world as a constant threat to the hive. There are other insects (let’s just say that spider and wasps aren’t bees natural allies) as well as other mammalian intruders including humans ourselves. The latter, along with the chemical threats to a bee, also highlight how in many ways we are abusing and endangering bees, which the environment needs and how a decline in them could be catastrophic in the long term. It has certainly made me rethink the value of honey. Then there is also the world of the hive and how it operates. For the bees it is normal and they know no different but as readers we naturally humanise it, meaning from the start of the novel we compare their world to a totalitarian regime rather than nature doing what it has to do. Paull knows this and uses it wisely to highlight the cause and effect of such a culture. She also brings much more into the analogy of humankind as bees, if you know what I mean, in terms of gender politics, class, monarchy, religion and being different. There are layers and layers and layers, it’s a brimming book. I mentioned above that this is a gripping novel. There is the pace and directness of the prose which to me read like a thriller, each chapter leaves you wanting to read on be it that something had happened in the hive or indeed to Flora herself. You also want to read on because the life of the bee and the beehive is so utterly fascinating. Both during reading and since I finished reading I have been coming out with endless facts about bees that I learnt through the book to anyone who will listen and several who won’t. Did you know bees can sting other bees without dying? Did you know bees were actually related to wasps but flowers changed all that? Did you know that there is a special mating ritual with a princess bee and her suitors? I could go on. All this came together to form an absolutely brilliant novel; if you haven’t guessed it by now I absolutely loved The Bees. It is one of those books that has, like a beehive, so many levels to it. You can read it as a fascinating nature book (Laline only embellishes a few facts here and there for fictional purposes, bees don’t live a year for example) with an insight into the world of the bee. You can read it as a literary novel about feminism, society and beliefs. You can read it as a thriller or a fantasy, almost sci-fi like, novel too. However it is you read it, do read it. I cannot praise it highly enough. So there we go my instincts were right, it’s a corker. Maybe insects are my think as I have also read and loved Grasshopper Jungle recently another very different book for me. Anyway, I will be very surprised if The Bees doesn’t get a nod from those lovely folk at The Bailey’s Prize for Women’s Fiction and even more surprised if it isn’t in my top five books of the year in December. If you would like to hear more about The Bees then listen to the latest You Wrote the Book where you can find me in conversation with Laline. Who else has read The Bees and what did you make of it? Tagged as Laline Paull, The Bees, You Wrote The Book!